Paleontologists from the University College Cork (UCC) in Ireland have discovered 125 million-year-old scales that are preserved under the plumage of feathered dinosaurs and early birds, revealing the first evidence of how dinosaurs cut their skin. 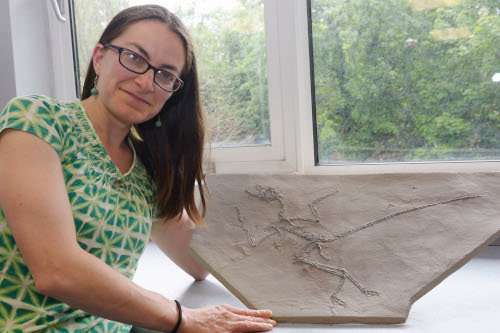 UCCs Maria McNamara and her team studied the fossil cells and scales of modern birds with powerful electron microscopes for the study, which was published today in the journal Nature Communications . 1; even the spiral twisting of individual fibers is still visible," Dr. Maria McNamara. Just like human dandruff, fossil dander consists of tough cells called corneocytes that are dry in life and full of protein keratin. The study suggests that this modern skin feature evolved sometime in the late Middle Jurassic period, at the same time as a host of other skin features developed. "At that time, there was an outbreak of feathered dinosaurs and birds, and it's exciting to find evidence that the skin of early birds and dinosaurs developed rapidly in response to supporting feathers," Dr. McNamara. Co-author Professor Mike Benton of the School of Earth Sciences of the University of Bristol said: "It's uncommon to be able to examine the skin of a dinosaur, and the fact that these are dandruff proves that the dinosaur his not lost whole skin like a modern lizard or snake, but lost skin fragments between her feathers. " Modern birds have very oily corneocytes with loosely packed keratin, which allows them to cool quickly if they fly for extended periods of time. However, the corneocytes in the fossil dinosaurs and birds were packed with keratin, suggesting that the fossils did not get as warm as modern birds, presumably because they could not fly at all or for so long.